Many questions received from collectors revolve around the history, age and/or value of a trivet. 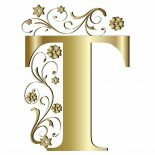 This is the second in a series of three blog posts to help you better evaluate the trivets in your collection. ● VINTAGE: Less than 100 years old. This category includes trivets produced before World War 2 as well as more recent, unique designs cast in smaller quantities. A number of mid 2oth century trivets were created in smaller quantities, making them quite collectible. They’re discussed in my second book The Expanded A-Z Guide To Collecting Trivets (2010). Here are two examples. 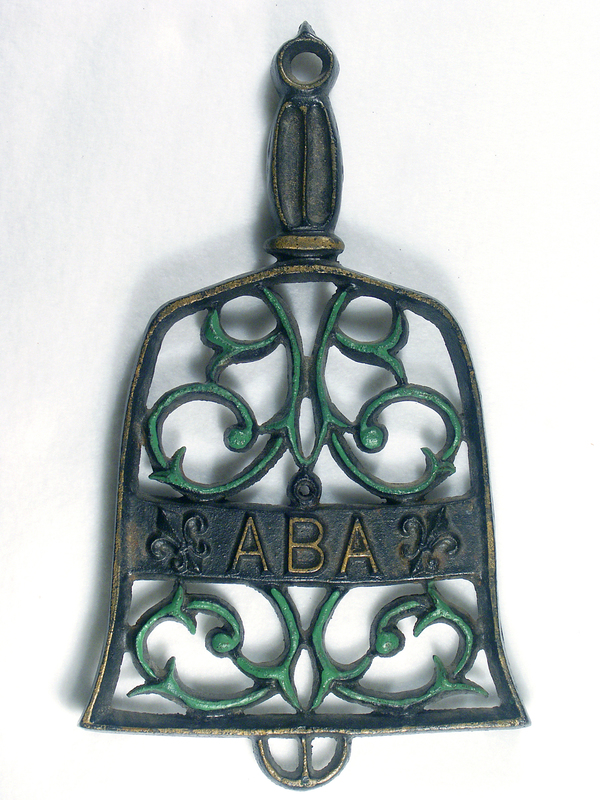 The American Bell Association (ABA) trivet, designed by Ralph Walker of Massachusetts, is an example of a unique design cast in smaller quantities. It was a fundraising project to finance the Walker family’s trip to the 1967 ABA Convention in Chicago, Illinois. 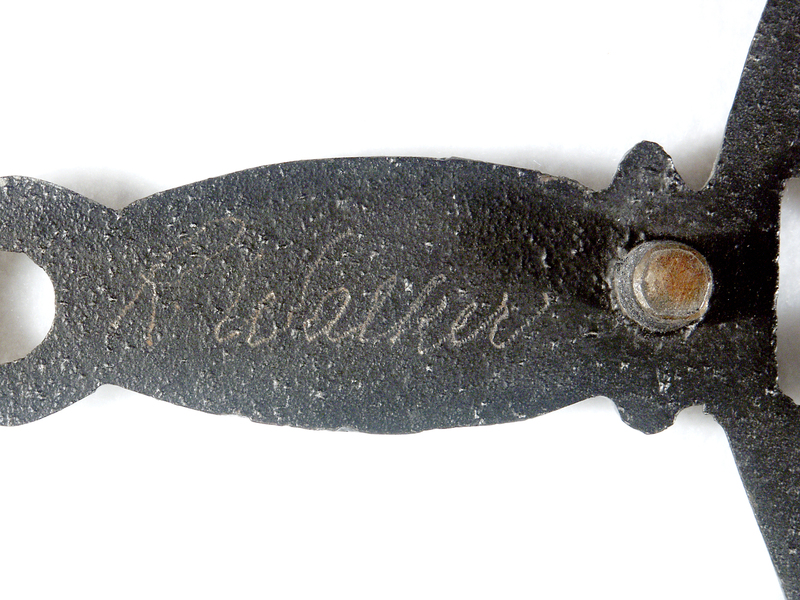 This trivet was cast in the foundry of the United Shoe Machinery Corporation of Beverly, Massachusetts where Ralph worked. My 2010 book “The Expanded A-Z Guide To Collecting Trivets” shares a letter from wife Rita Walker, in which she commented on the production of the trivets. Here’s an excerpt. Ralph Walker died in 1998; his wife Rita passed away in 2015. A few years before she died, Rita gifted me a second ABA trivet in the same design but without a handle. It was a signed prototype of which only a few were cast. I’m honored to have both versions of the ABA trivet in my collection. Pal-Bell of Tel-Aviv, Israel (1939-1956) developed a process of treating raw brass and bronze with chemicals to produce a green patina similar to aged verdigris. The style became synonymous with mid 20th Century Israeli metalware. Pal-Bell’s two factories, located outside Tel-Aviv, employed around 100 artisans. Vintage Pal-Bell brass castings, including trivets, are prized today by collectors. Over time I was able to collect the five designs above. The signature below is typical of how Pal-Bell signed their trivets. 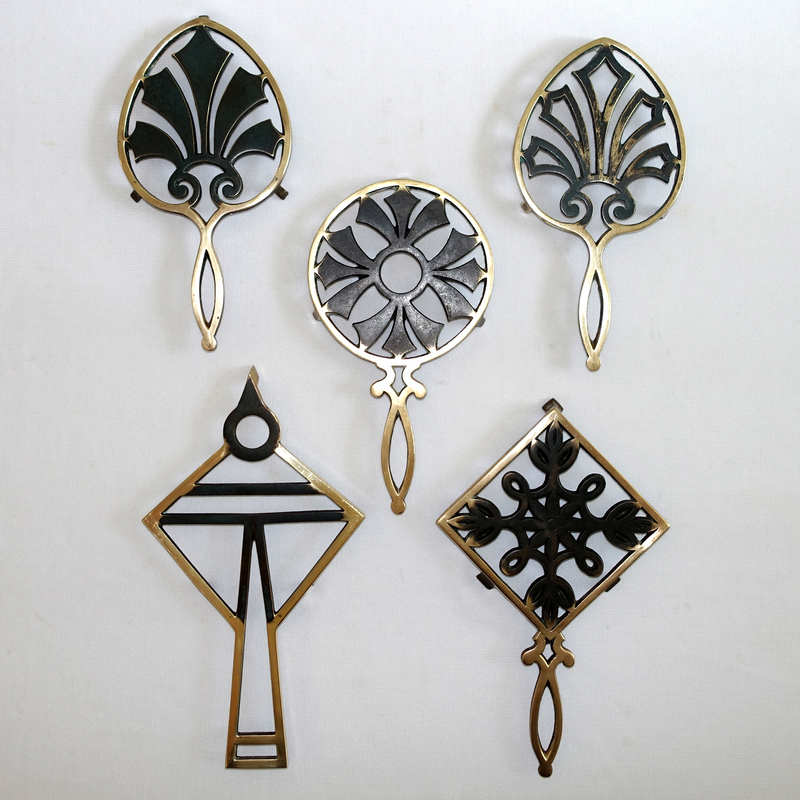 See also my earlier blog post Vintage Pal-Bell brass trivets. Older, pre World War 2 trivets often fall in a gray area where it becomes harder to judge origin and age. The best advice I can share when collecting is to choose a well cast, undamaged trivet in a design you like. A plated finish in great condition is rare but makes a trivet even more collectible. Here are some quick pointers for identifying older vintage trivets. ● Familiar antique designs continued to be popular. 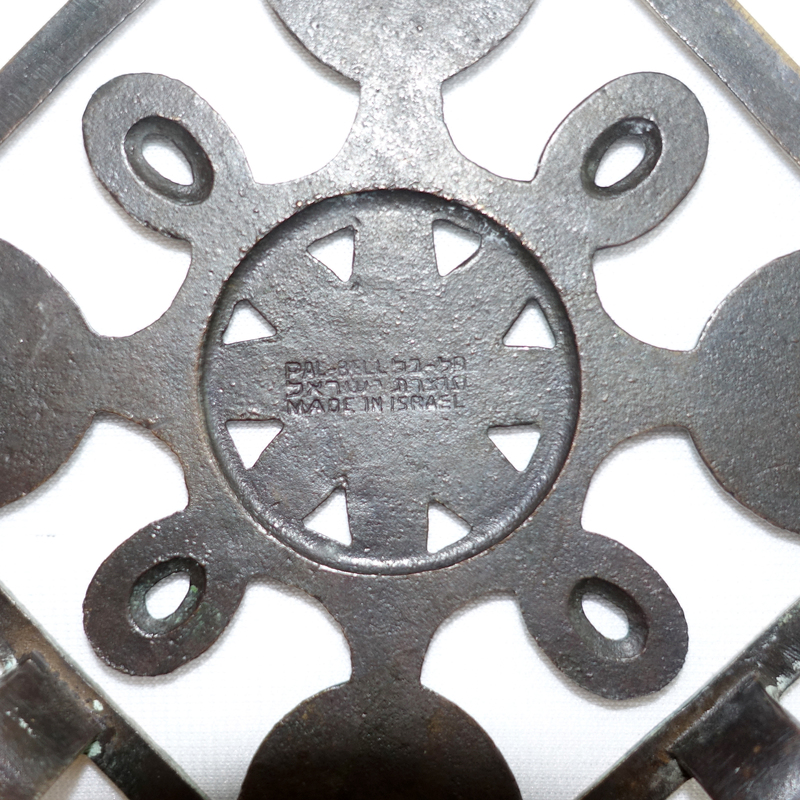 ● Whenever a trivet is used as a pattern, the resulting trivet will be at least 1/8″ smaller due to metal shrinkage. ● Vintage trivets were cast through the rim. ● Machine grinding after 1900 meant the end of prominent gate marks. ● Vintage trivets were rarely signed. ● Sometimes a 3 digit lot number appears on the reverse. ● Over the decades legs got shorter. ● Popular finishes: black enamel; nickel plating; copper plating. ● Check out vintage housewares catalogs and magazines for ads. This entry was posted on August 16, 2017 by Lynn Rosack in Collecting Basics, Vintage Trivets & Stands and tagged American Bell Association, brass, cast iron, Pal-Bell, Ralph Walker.